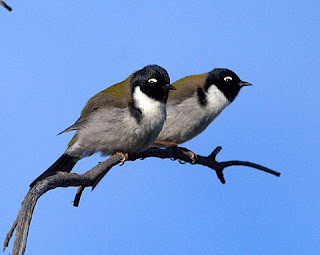 Birds in Tasmania: What Early Bird? With such fine weather of the last few days, I finally threw off my recent lethargy, and with an early start, headed for the Goat Bluff area. I have a routine at Goat Bluff, starting with the short walk to the lookout. Occasionally, especially during the Winter months, you can spot the odd albatross, albeit, usually some kilometres off the coast. But that morning, I could only pick out a few Australasian Gannet, and a mob of gulls off nearby Betsey Island. With a stiff breeze blowing, and frost still evident on the ground, I was glad to get away from that exposed spot and into the coastal scrub. Walking down the track towar ds Hope Beach, I was struck (and disappointed) by the lack of birds. 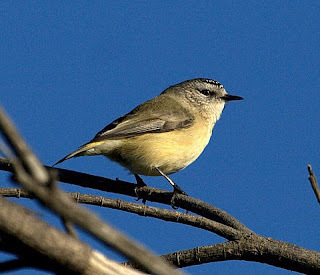 A few distant Crescent Honeyeaters called, and the odd, unmistakable twinkling, of an Eastern Spinebill, but little else. I reached a spot close to the beach and scanned the area. I picked up a pair of Hooded Plovers, a rare sighting on this beach in recent times, and then an adult White-bellied Sea Eagle, low over the sea, leisurely making its way to Betsey. It was some consolation, but I had expected more. I wandered back up, and down the eastern side of the bluff, hoping to see at least a Striated Fieldwren, a common, if elusive, resident here. No show, only a flock of passing Silvereyes, and the calling of unseen Yellow-tailed Black Cockatoos in the scrub below. By now I had been here nearly 2 hours, taken a few scenic shots in the low angle light, and was about to give up. Back up to the car park, one last look along the road--and then they all started appearing! I disturbed the small flock of resident Yellow-rumped Thornbills, now reduced to just 3, from a dozen or more in the Summer--casualties, or moved on? 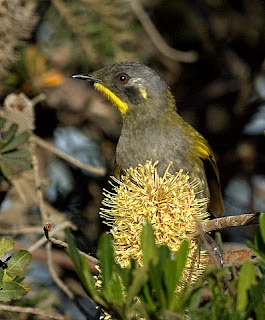 Then a number of honeyeaters, feeding on the few remaining banksia flowers, passe d in quick succession, as I stood and watched. Firstly an Eastern Spinebill, supplanted shortly by a Crescent Honeyeater, in turn pushed out by the very nervous Yellow-throated Honeyeater, pictured at right. Eager to get some shots of Yellowrumps, I positioned myself in the scrub near where they were feeding, and eventually, one came just close enough to get a worthwhile shot (lower left). Hoping that I might get a better shot, I waited. It proved fruitless for the Yellowrumps, but instead, I had a succession of birds prop on top of a nearby dead sheoak. First a Grey Fantail, then a Yellowthroat, followed by a Crescent Honeyeater, a pair of Scarlet Robins, and finally a few Black-headed Honeyeaters (top left). So I got my fill of photographs, but left wondering why I had bothered to get there so early! The yellow-rumped thornbills have been prevalent at Tinderbox lately. A few weeks ago, a group of about 40, plus one flame robin, were busy feeding on the ground. They took little notice of me and my camera but with early morning low light, I didn't manage one really sharp shot of the thornbills in over a hundred photos. Fortunately I had more success with the robin. Thanks for commenting. I too, have seen far more Yellowrumps around this Winter, and I agree they seem to be surprisingly difficult to photograph, and in large flocks, they're usually very flighty. That's why I was pleased to get a few images. I think the real shot would be to get them in flight with their yellow rumps showing, so much more interesting.